Main Courses There are 60 products to choose from. Takeaway Lanzarote - Restaurants Playa Blanca Cooked with cream and almonds. 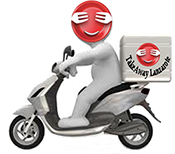 Takeaway Lanzarote - Restaurants Playa Blanca Tikka pieces cooked in cashew nut paste. Takeaway Lanzarote - Restaurants Playa Blanca Cooked with onion and medium spices.